The second thing in the tag is an id or label for that file: id="Section0001.xhtml". Notice that Sigil has recycled the filename (Section0001.xhtml) and used it again as the label, but logically the filename and label are two different things. The filename must exactly match the name of the file, whereas the label can be any text you wish. Sigil just happens to have used the filename for the label in this case. Whatever is used for the label, it must be unique (i.e. all labels should be different) and should be a single text string with NO SPACES. The names are case SeNSiTiVe. I suppose it would in principle be possible to make the filename and label different from one another by editing the entry in the manifest, but I cannot see what would be achieved by this and have not tried to do it. And, as the label is used to identify the file in the spine, you would need to edit that as well, which is getting messy and leaves you open to making errors, which you do not want. The final thing in the tag is a ‘media-type’ attribute, which in this case has the value: ‘application/xhtml+xml’. This tells the e-reader that the file is an xhtml file. A complete list of all media-type attributes listed according to the file extension can be found here: http://reference.sitepoint.com/html/mime-types-full. NB I couldn’t find .ttf in that list! Sigil will know about all the valid media-types and so if you import a file into Sigil it will look up and enter the correct media-type for you when it creates the entry in the manifest. The syntax is identical with that used for an xhtml file, however note that the path is different: ‘Images/’. This is because the image is in the folder called ‘Images’, NOT in ‘Text’. Beware of the difference between the extension: .jpg and the final bit of the media-type: jpeg. 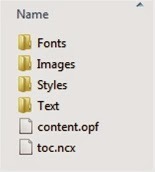 For some reason, Sigil has chosen to label the ncx table of contents ‘ncx’, rather than re-use the filename, which is different from the way it labels every other item in the manifest. I cannot see any explicit reason in the opf specification why the label in the manifest has to be ‘ncx’, and I would have thought another label could be used. However as this would achieve nothing, just be aware that Sigil labels the ncx differently from other items in the e-book. The choice made by Sigil follows the example given in the opf specification, but as far as I can see that is just an example. Still, best left alone. It works, so don’t fix it! Be very careful to distinguish between the ncx table of contents (toc.ncx) and the html table of contents (named by you but let’s call it Contents.xhtml). This last file is a section in the e-book which contains hyperlinks to the various chapters within it. The ncx table of contents on the other hand is used by the e-reader to generate a completely different table of contents according to its own programming. This will most likely be accessed when the user presses a button somewhere on the e-reader, which then displays a table of contents which it has generated from the ncx table of contents file. You will need BOTH files for your kindle e-book. The html table of contents is entered in the manifest just like any other chapter in the e-book. See my posts on how to generate the html table of contents and how to generate the logical table of contents for further information. There are important differences between an epub and a kindle e-book for the front cover image and html table of contents and these are covered by a number of other posts. The foregoing relates only to epub. To get started converting a valid epub to Kindle click here for information on how to deal with the front cover and here for information on how to deal with the table of contents. Other information is linked from these posts. For both kindle and epub you will have loaded a cover image, and this will be linked as indicated above, just like any other image file. For the e-pub, you will have an html cover file, and that will be linked just like any other chapter in the e-book text. It falls at the beginning of the e-book, but the location of its entry in the manifest is NOT important. Notice again that the path to the file is different because the fonts live in the ‘Fonts’ folder. To avoid generating warnings in epubcheck, it is advisable that the names of the font files are single text strings with NO SPACES and these filenames MUST also be used consistently in the CSS stylesheet. For the sake of completeness I will post on how to embed fonts later, although I would advise against it. As I said earlier, I couldn’t find a media-type in the online list corresponding to an extension of .ttf. The code in the example above was generated by Sigil when I imported the font file into the epub and works just fine. Importing a font file into your e-book using Sigil should result in the correct media-type being entered in the manifest, whatever the type of the font. Once again, as this will have been created in the ‘Styles’ folder the path is different. The filename, Style0001.css, can of course be anything you like. Style0001.css is just the default filename Sigil gives it when it first created it. Renaming it in Sigil will update the entry for it in content.opf. The stylesheet will need to be linked to each chapter in the e-book and any embedded fonts will need to be referenced in the stylesheet. See my post on how to create and link a css stylesheet for more information on how to link it. I will cover embedding fonts in a future post and link it here when it is published. The id/label given to each item in the manifest is used to reference it in the <spine> NOT the filename and path. The order in which the items appear in the manifest is of no importance. What is important is that each item within the ebook MUST appear once and once only in the manifest and be assigned a unique id (except content.opf, which should NOT be included). It ends with a closing </manifest> tag. Sigil will create the entries in the manifest for you but you are going to have to edit it to link the cover image and the html table of contents properly for kindle, so it is as well to be completely familiar with how the manifest is constructed. Next Steps: My next post will complete this sequence by explaining the syntax of the <spine> and <guide> sections of content.opf. I will then go on to cover how to test your completed e-pub e-book and begin converting it to kindle.